My mom moved to a care home (well, a few actually) in the past two years. 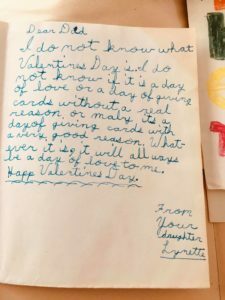 While the family was removing her belongings from the old condo and putting them into storage, my sister came across this Valentine’s letter from me to my dad. My father passed away many years ago and I wrote this letter when he was still alive. I was eight. I’m sixty-one and three quarters now. I do not know what Valentine’s Day is. I do not know if it is a day of love or a day of giving cards without a real reason. Or maybe it’s a day of giving cards with a very good reason. Whatever it is it will always be a day of love to me. This letter has been carted from place to place by my mother. It has come up often in my conversations with her, always for different reasons and not all of them nice. But when I see the letter I just see me. A young girl, loving her daddy. I know that’s as it should be because I understand how my brain function creates my reality. I understand how the brain creates and recreates memories depending on the perceptions and emotions of the moment. My childhood has a lot of abuse in it. Most of it from my mom, some of it from my dad. But it also had a lot of love and hard work, a lot of homemade dresses and homework support, a lot of friends and tons (by today’s standards) of freedom. I am not deluding myself into thinking it was easy for any of us, my parents included. Instead, I am sharing what I learned and focusing on what I gained. I love my parents and I’m glad to see that Valentine’s Day served a beautiful purpose in my life. Happy Valentine’s Day, everyone. It is not just about romance. It is about FEELING the softness and warm flow of neurochemicals that accompany LOVE. *To learn more about my history of focusing on the love and healing from abuse, please read my book Sever The Cycle of Abuse with The Sub Shop Savior.